We have two different Early Bird Aurora Break packages (1-night or 2 nights) available from September 20th to November 19th. 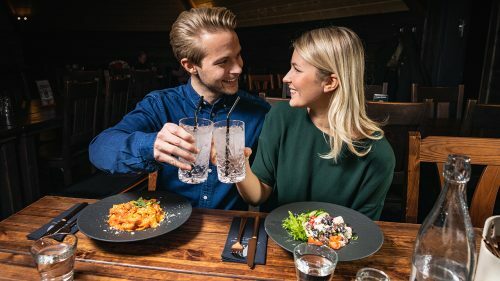 Both include transfers from Rovaniemi, 3 course dinner, and experiences for each day of your stay. 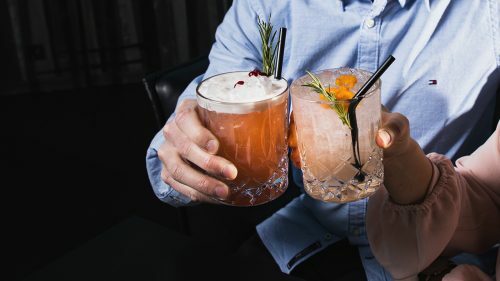 In our igloos with 365° glass roof you can fall asleep while watching the lights in the sky, after enjoying dinner in our restaurant and raising a toast at SkyBar. Of course you can also book just accommodation in our glass igloos. 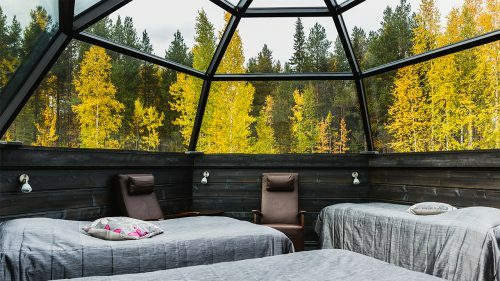 Arctic Snow Hotel and Glass Igloos is located by a lake in the small village of Sinettä, 30 min drive from Rovaniemi in Lapland (Finland). In the absence of city lights you have a good chance to spot Northern Lights and take amazing pictures. We can’t give a guarantee that you will see the Northern Lights during your stay, but when the conditions are right, chances are good. Check in at 3 pm, check out at 11:30 am. All glass igloos have bathroom (toilet and shower), motorized twin beds for a perfect view of the sky through a 360 degree glass roof, wi-fi, hairdryer, electric kettle and mini fridge. Breakfast is served from 8am to 10am. When in Finland, try Finnish sauna! The sauna is booked privately for each party and includes the use of outdoor jacuzzi. 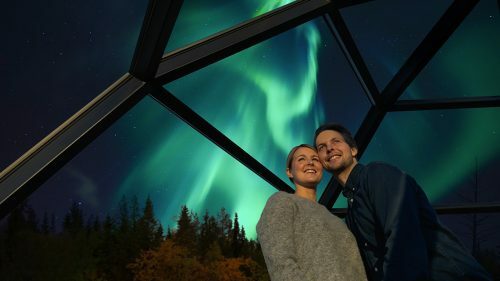 Imagine inhaling the crisp, fresh autumn air while soaking in warm relaxing bubbles – and if you are lucky, watching the northern lights at the same time! Lappish delicacies are served in the magical atmosphere of our Kota restaurant. Three different main course options available, also vegetarian and vegan. On a visit to a husky farm you will see how sled dogs are prepared to be the amazing athletes that they are. Enthusiastic dogs will happily take you on a cart ride* down the forest trail. * For animal welfare reasons, husky cart rides are arranged only if the temperature colder than +10 C.
Our guide will drive you to Santa Claus Village, the most popular attraction in Rovaniemi, where you can cross the magical Arctic Circle, meet Santa Claus and visit his official post office and do some souvenir shopping. The excursion includes lunch . Our guide will take you to local Finnish home, where you will learn about living in Finnish Lapland. The lady of the house will show you how traditional Finnish flatbread is made and each visitor can bake a bread of his own and finally taste it with coffee/tea and local sweet pastries.